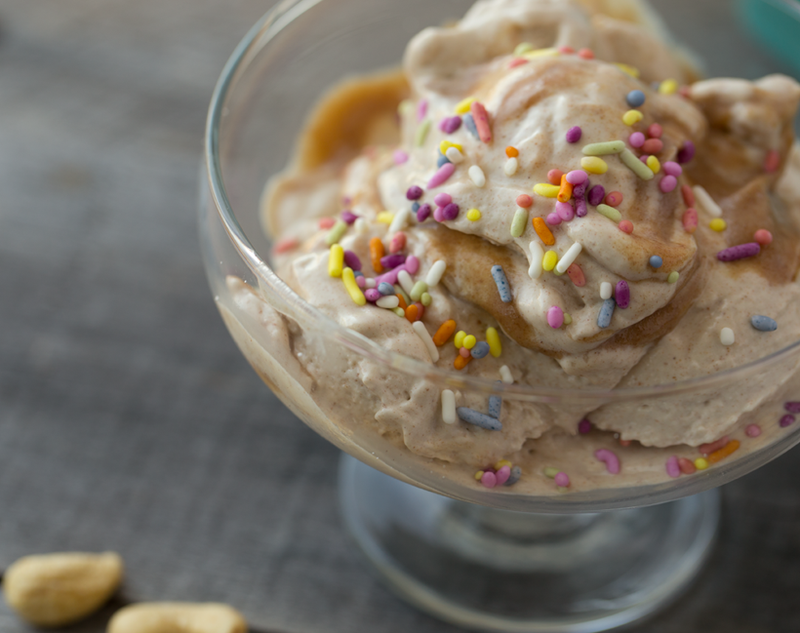 Before we settle into the "Ok, I'm ready for fall now" vibe, I want to squeeze in this super delicious dessert recipe for Salted Caramel Cashew Ice Cream. 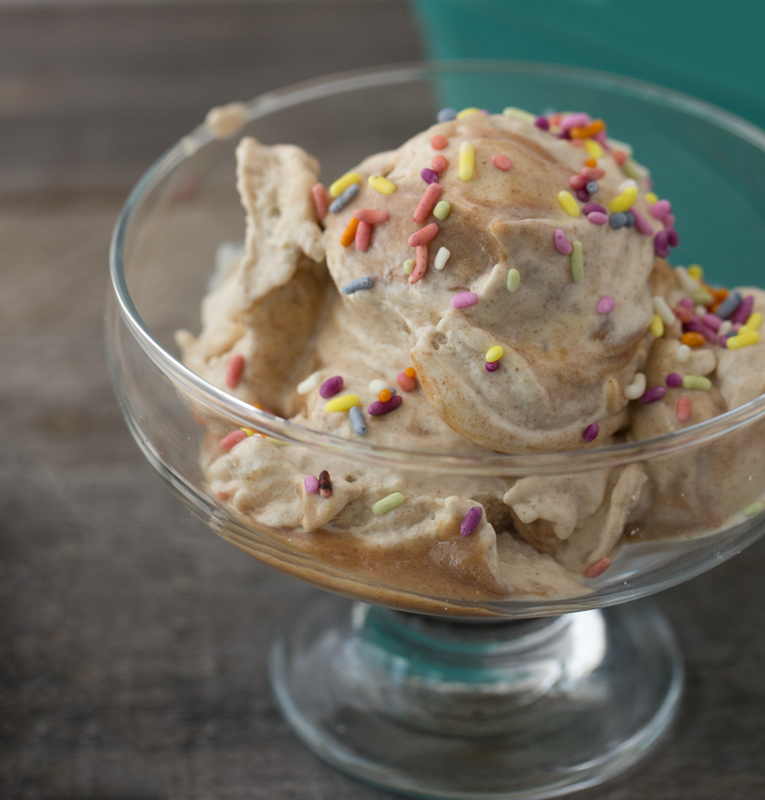 Before pumpkins, apples and fall spices start filling my recipe planning list, I think salted caramel in creamy ice cream form deserves a spotlight on my blog. One last swoon for ice cream.. 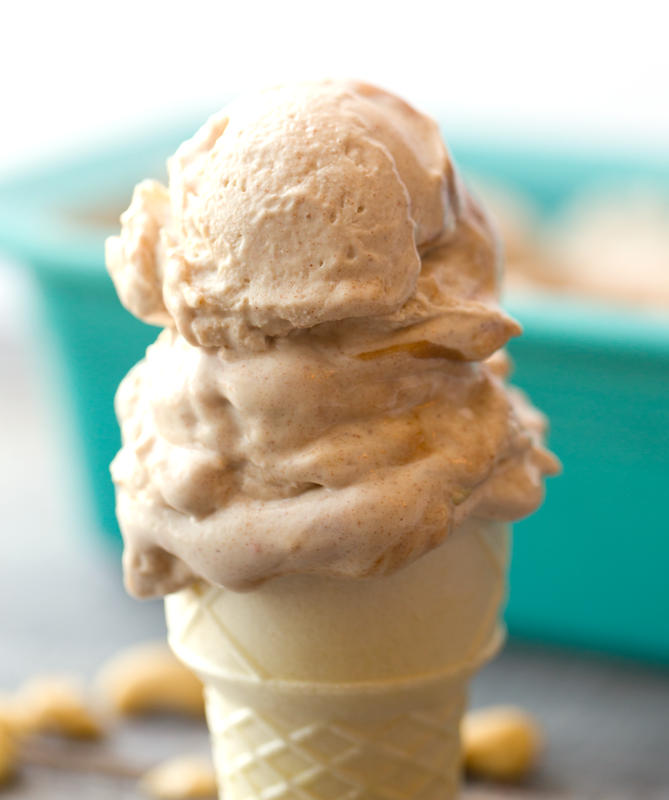 I don't know about what you have been crushing on this summer, but for my husband and I it is cashew ice cream. Yup, it's a problem. Every since we discovered cashew ice cream (crazy, but I only just finally tried it a few months ago) we have been having one (small) cone after dinner basically every. single. night. It's just so good and hey, its' vegan right?? Just kidding. I stopped using that excuse to eat anything I wanted to a long time ago. 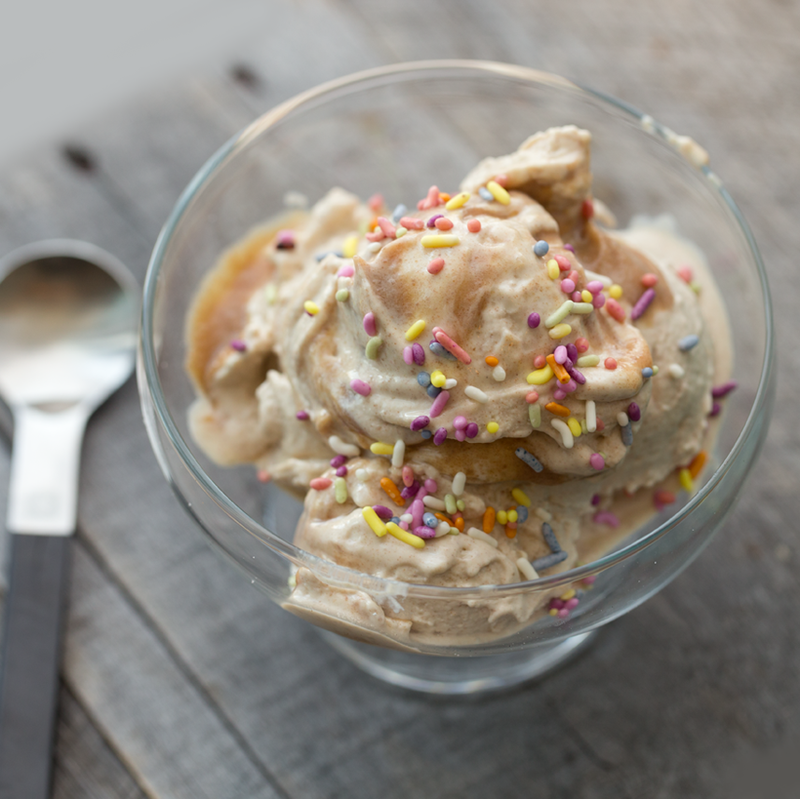 But really, cashew ice cream IS pretty healthy fare in terms of whole food ingredients. Cashews instead of high fat, cruelty-infused dairy? Any day please. And this ice cream is sweetened 100% with fruit, aka Medjool dates. I wasn't sure how that would turn out, but it is perfection. 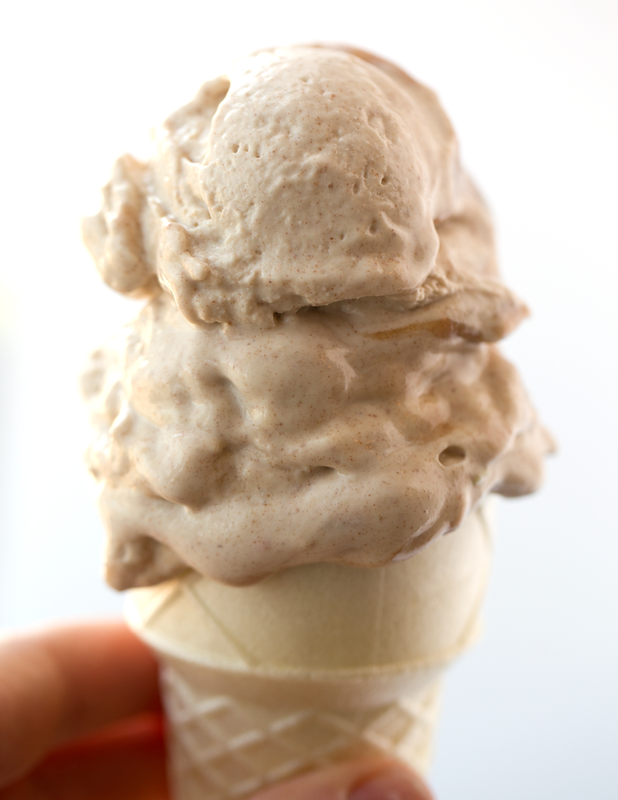 I love all the vanilla, cinnamon and salted caramel flavors all swirled together in each spoonful. Sprinkles on top.. 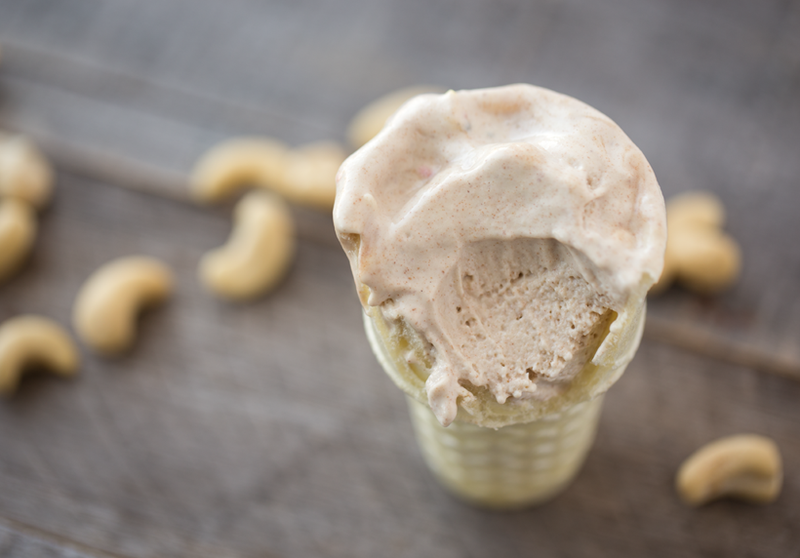 This recipe brings the bliss of store-bought cashew ice cream to your ice cream maker. I hope you enjoy it!.. Ice cream cones. Here is the most serious question of them all: are you a plain cone, sugar cone or waffle cone type of person? For me.. I do love a waffle cone when I can find one that is homemade, vegan and gluten-free -- but since that rarely happens -- I am a plain cone girl. I love how light and crispy a plane cone it. Though when I was a kid, I preferred sugar cones. More sugar, right!? And when it comes to sprinkles, there are actually a few vegan options. There are India Tree Sprinkles and then there are Edward and Sons Sprinkelz. I love both brands, but the India Tree ones have more vibrant colors. Both are vegan and all natural! And of course you will need a high speed blender to blend the base: My favorite high-speed blender is a Vitamix. 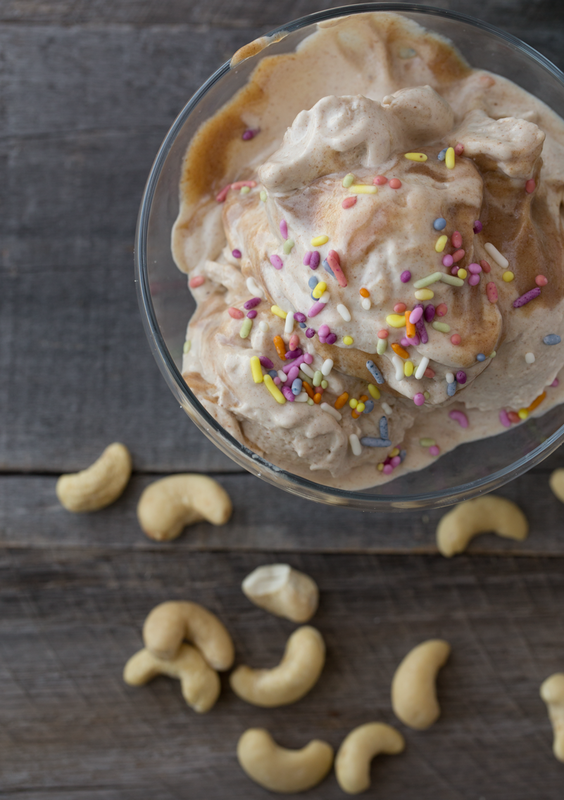 Enjoy this and let me know if you love cashew ice cream as much as me! 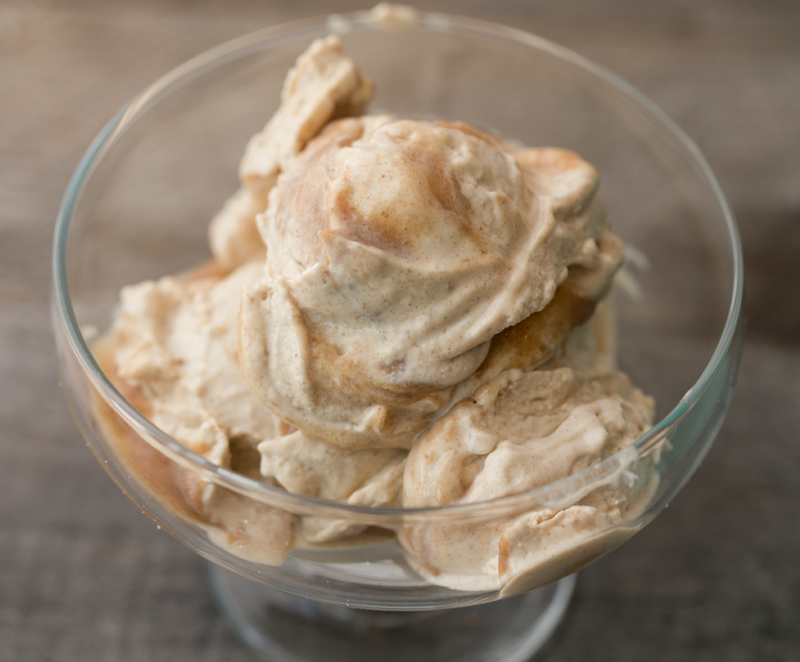 This rich and creamy cashew ice cream tastes like caramel, vanilla and cinnamon. Soak cashews for at least two hours in hot, salted water. If you have time, you can soak them overnight for even easier blending. When you are ready to make your ice cream, make sure your ice cream container (for your machine) is fully frozen. Soak your Medjool dates in warm water for a minute, then remove the pits. Add the pitted dates to a high speed blender or food processor. Add in the soaked 3 cups of cashews, followers by the non-dairy milk, vanilla and cinnamon. Blend until smooth and creamy. Then pour this mixture into your frozen ice cream machine container and turn your machine on. Rinse out your blender or food processor container to make the salted caramel swirl. Add all the salted caramel ingredients to the processing container. (Again, you want to soak the dates in warm water for a minute before pitting them. This helps to loosen and soften the flesh.) Blend until thick and creamy. 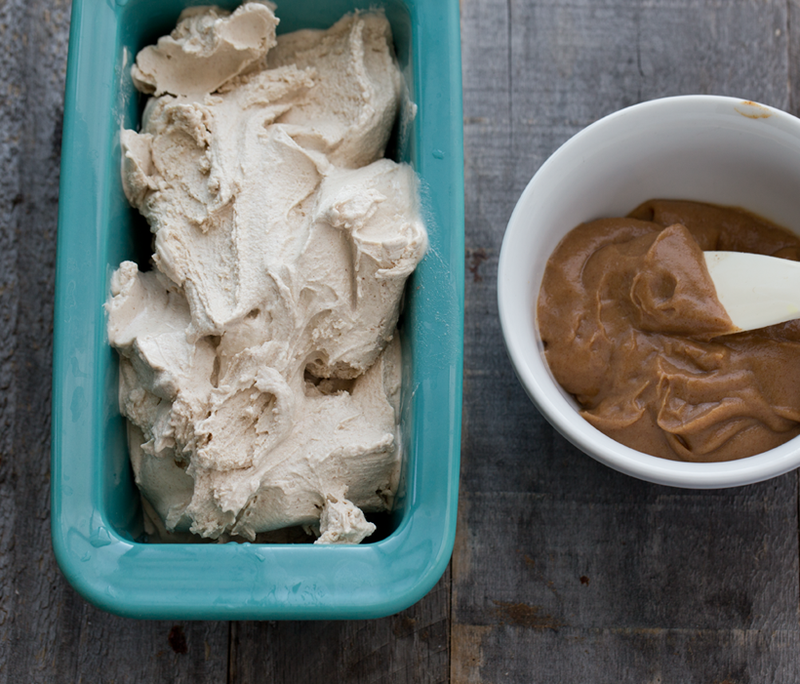 Pour the salted caramel in a small bowl and place in the fridge until ready to swirl. 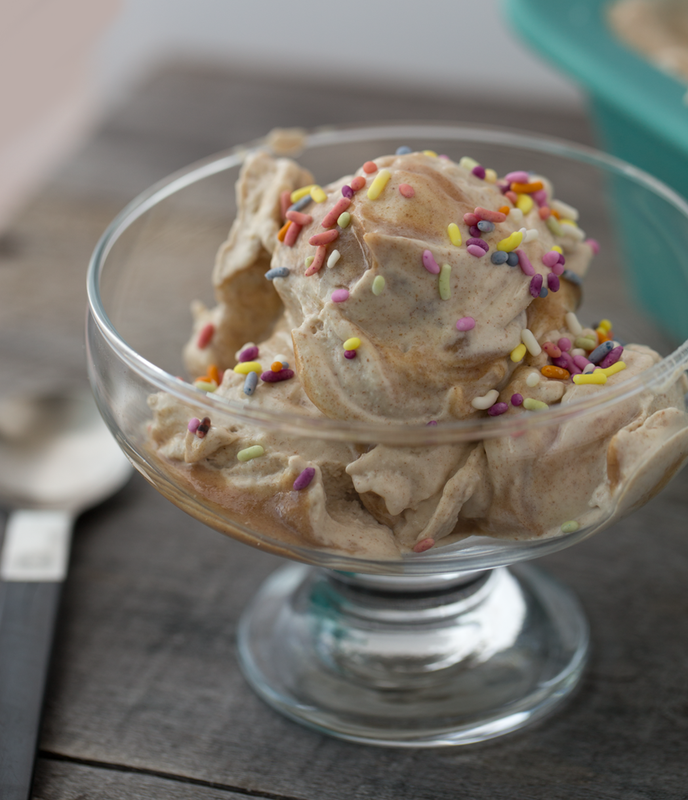 Your ice cream should be ready in about 20 minutes, sometimes a bit more and sometimes less. When your ice cream is ready, pour it into a freezer-friendly container, like a glass loaf pan. 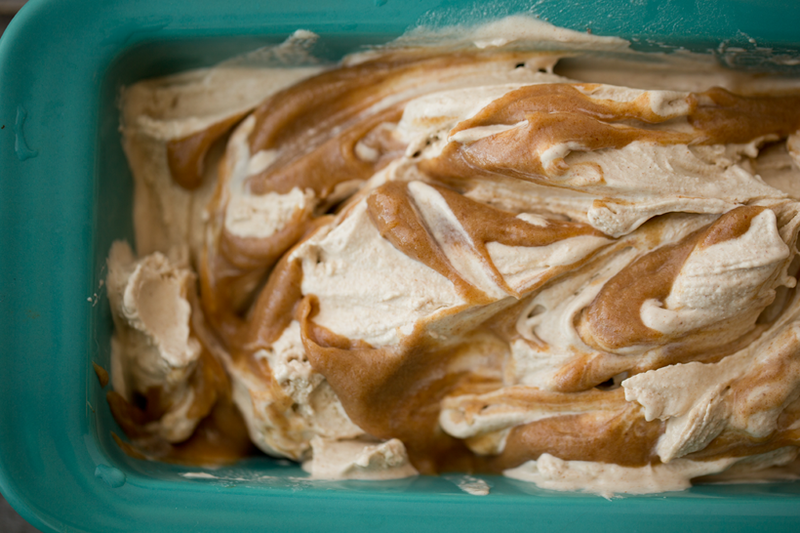 Swirl the salted caramel sauce into the ice cream. Then place the ice cream in the freezer. Your ice cream and caramel should be ready to scoop and serve in about 20-30 minutes, depending on how cold your freezer is. Store leftovers, covered, in the freezer. This ice cream gets rock hard when fully frozen, so always allow at least ten minutes for it to soften on the counter before scooping.